For 67 years, the house at 2565 N. Humboldt Blvd. was owned and occupied by the same family. In fact, it was even designed by one of the family members. The story goes like this: Back in the early 1920s, Joseph Swietlik asked his son Walterif he would design a house for a 7,680-square-foot lot he owned on what wasthen called Humboldt Avenue. Walter said, sure, and drew up some plans. On April 25,1922, the building permit was approved. And just shy of six months later, in early October, construction was completed on this bungalow-style home with the stucco and brick exterior, and the Swietliks moved in. 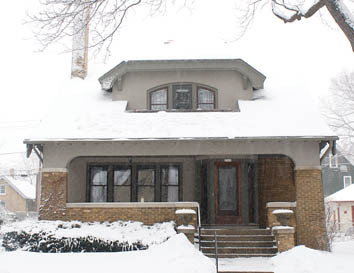 Prior to moving intothis house, though, Joseph and his wife, Michalia, were no strangers to Riverwest .They had lived on Booth Street, then Meinecke Avenue, and then Clarke. Like a lot of Riverwest residents of the day, Joseph and Michalia emigrated from Poland. They were just in their mid 20s at the time, the year was 1889. Once settled here, Joseph worked a variety of jobs, including laborer, mechanic and brewery worker. The latter was his main and final occupation, working at the old Joseph Schlitz Brewing Company. Throughout all this, the two had five children – three sons and two daughters. One oftheir sons, Frank (the only one to marry), held a variety of prestigious titles throughout his career. He was a prominent attorney in private practice, a Milwaukee County special assistant district attorney, a circuit court judge, and the Marquette University Law School dean for more than 19 years. He also served as Chairman of the Milwaukee Fire & Police Commission. If that weren’t enough to fill a résumé, he was also named Chairman of the American Relief for Poland. It was in this position that through his efforts in bringing aid and sustenance to more than two-million Polish refugees throughout the world, Pope Pius XII conferred on him the Knighthood of St. Gregory. He died in 1983 at age 94. The youngest of the three brothers, Ted, also became an attorney in private practice, and in addition, he served on the Milwaukee County Civil Service Commission. This leaves Walter, the engineer (architect) of the Humboldt Boulevard house. After World War I ended in 1918, Walter Swietlik returned to Milwaukee after serving as a lieutenant in the U.S. Army Artillery. When his father asked him to design thehouse, he drew up several plans before settling on the spacious 2,517-square-foot bungalow you see today. The design included four upstairs bedrooms, a small sewing room, and a bathroom. Downstairs would house akitchen, pantry, a large powder room, a living room with a fireplace, a good-sized dining room, a den, and an office. One of the interesting features Walter incorporated into the layout of the house is that it can be converted into a duplex if that were ever a desire for future owners. For instance, gas lines in the downstairs kitchen lead upstairs to the sewingroom, which could then be converted into a kitchen. A large powder room on the first floor has enough space that a bathtub or shower could be added. A wall divides the basement so that two families could have their own area. Same thing with the four-car garage – it too has a dividing wall, splitting the garage in half. It’s awell-thought-out design for a house, considering Walter wasn’t an architect by trade. He was actually a sewer contractor who owned a business with two other partners. And shortly before World War II, Milwaukee Mayor Carl Zeidler appointed Walter as Commissioner of Public Works, a prominent position he would hold from 1941 until 1954. He died in 1981 at the age of 89. The last two family members to live in the house were the two sisters, Helen and Wanda. Unlike their three brothers, the two sisters did not attend college, which was typicalfor young women of that time period. Both worked office jobs (Helen worked forher brother Ted) and were also skilled seamstresses. As the two women got up there in age, they finally sold the home in 1989, thus ending the Swietlikf amily’s tenure in the house. The newowners, Richard Knoedler and Kathleen Barnes, have lived in the house eversince and have kept it as a single-family unit. The structure you see today looks pretty similar to what it looked like back in 1922, as no significant alterations have been made, merely maintenance and periodic upgrades. One interesting addition Richard made, though, was in putting in a back patio and walkway using the bricks that were removed from the alley when the surface was replaced with concrete. To check out this patio for yourself and other alterations Richard and Kathleen made, the Swietlik home will be open to the public as part of the “Spaces andTraces Tour” by Historic Milwaukee. This one-day event takes place Saturday,May 21. For more information, including prices and ticket information, visit Historic Milwaukee at historicmilwaukee.org.